Can I get a custom model? on the main Lang BBQ Smokers site. In six short steps we will help you to discover Lang BBQ Smoker® Cookers. You will easily select the right model for you and your barbecue needs. Whether for your backyard, the competition circuit, or for commercial needs, we will introduce you to the ultimate in smoker cooking. Once selected, we can customize your new smoker/cooker with special options designed just for you. Check out our tips on caring for your smoker cooker and how to easily keep it clean for optimum results. In addition, once you have selected the perfect model for you, our easy guide to buy and ship your Lang BBQ Smoker® will have your new smoker at your door in no time. We make it easy for you to make the best barbecue in town…we guarantee it! Ben Lang, owner, operator and creator of Lang BBQ Smoker® Cookers revolutionized BBQ cooking with his unique reverse flow cooking and his clean heat concept. Since 1988 Ben and his family have been providing BBQ enthusiasts hand made BBQ’s that give them consistently perfect barbecue. ... hear what Ben has to say in the video below. What is a Smoker Cooker? A smoker cooker is an outdoor grill that preserves, cooks, and flavors food by exposing it to smoke through burned materials: most often wood. You can use the charcoal grill as well as the smoker for a variety flavors. There are cookers for back yard use, commercial use or for competitions. Some models can be used for all three! 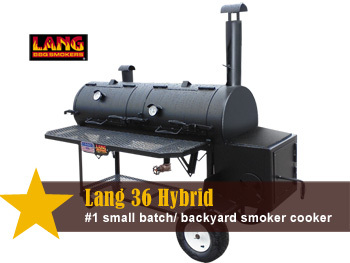 There is a Lang BBQ Smoker® cooker model for every need. What makes a Lang BBQ Smoker® cooker above the rest? Lang BBQ Smokers® are #1 BBQ smoker cookers for a reason. Ben Lang, the man who designed Lang BBQ Smokers® is the originator of what has become known in the smoker cooker industry as the reverse flow, off set-fire-box design. Often copied, but never the same, this technique prevents over smoking through the reverse flow technique. You control the amount of smoke you use. The means over smoking and too much smoke in the meat is never a problem. Lang BBQ Smokers® are all handcrafted with 1/4" plate steel - the heavy steel is key to maintaining the cooking temperatures. Lang BBQ Smokers® give you the World's Best Barbecue because it sizzles and sears the meat to "goof-proof" perfection with consistent heat that you can control via the built in temperature gauge. The result is a succulent and moist piece of meat every time. Lang BBQ Smoker® Cookers make clean heat possible with the combination of the reverse flow technology and the ¼" steel design along with keeping your Lang BBQ Smoker® cooker clean after every use. By keeping the cooker clean you are assuring that the essential heat can get to the food and cook it as it should be cooked. Cleaning the grill is a snap, and Ben offers tips on how to do it quickly and efficiently in his video featuring tips for seasoning, firing up and cleaning your smoker cooker. When you want to charcoal grill some of your favorite cuts of meat, no need to go to a separate grill, just fire up the charcoal grill on the Lang BBQ Smoker® cooker model that features the chargrill built right in. There are models available in every size from the 36" right on up to 108" model that include the charcoal grill. Whether you use your Lang BBQ Smoker® cooker with the chargrill or without the chargrill or maybe with both, you will serve the best barbecue there is…we guarantee it! When you cook on a Lang BBQ Smoker®, your friends and family will think you are a barbecue genius. Next -see the models…one is sure to fit your needs!